Hilton has 15 brands across different market segments, including Conrad Hotels & Resorts, Canopy by Hilton, Curio - A Collection by Hilton, Hilton Hotels & Resorts, DoubleTree by Hilton, Embassy Suites Hotels, Hilton Garden Inn, Hampton by Hilton, Homewood Suites by Hilton, Home2 Suites by Hilton, Hilton Grand Vacations, Waldorf Astoria Hotels & Resorts, Tru by Hilton, Tapestry Collection by Hilton, and Motto by Hilton. On December 12, 2013, Hilton again became a public company, raising an estimated $2.35 billion in its second IPO. At the time, The Blackstone Group held a 45.8 percent stake in the company. In October 2016, HNA Group agreed to acquire a 25 percent equity interest in Hilton from Blackstone. The transaction was expected to close in the first quarter of 2017. Hilton's largest stockholders are HNA Group, Blackstone, and Wellington Management Group, which own 25%, 15.2%, and 6.7% of Hilton common stock respectively. In 1919, Conrad Hilton purchased his first hotel, the 40-room Mobley Hotel in Cisco, Texas, and bought additional Texas hotels as years passed. In 1925, the Dallas Hilton became the first hotel to use the Hilton name. In 1927, Hilton expanded to Waco, Texas, where he opened the first hotel with air-conditioning in public areas and cold running water. In 1943, Hilton purchased the Roosevelt Hotel and the Plaza Hotel in New York, establishing the first hospitality company to span the contiguous United States. The company incorporated in 1946 as the Hilton Hotels Corporation, and subsequently began public trading of shares on the New York Stock Exchange. In 1947, the Roosevelt Hotel became the first hotel in the world to have televisions in its rooms. The entrance to the Waldorf-Astoria in New York, Conrad's "greatest of them all"
Hilton International was founded a few years later, in 1949, with the opening of the Caribe Hilton Hotel in Puerto Rico. Barman Ramon "Monchito" Marreno claimed he created the piña colada cocktail at this resort. Hilton purchased the Waldorf Astoria New York in the same year. The Hotels Statler Company was acquired in 1954 for $111 million in what was then the world's most expensive real estate transaction. One year later, Hilton created the world's first central reservations office, titled "HILCRON". The reservations team in 1955 consisted of eight members on staff booking reservations for any of Hilton's then 28 hotels. Reservations agents used the "availability board" to track records. The chalk board measured 30 feet (9.1 m) by 6 feet (1.8 m) and allowed HILCRON to make over 6,000 reservations in 1955. Bookings could be made for any Hilton via telephone, telegram, or Teletype. Later in 1955, Hilton launched a program to ensure every hotel room would include air conditioning. In late 1955, Hilton opened the first post–World War II property in Istanbul. Hilton is credited with pioneering the airport hotel concept with the opening of the San Francisco Airport Hilton in 1959. In 1965, Hilton launched Lady Hilton, the first hotel concept created specifically for women guests. To appeal to female travelers, a number of properties offered floors occupied by only women along with distinct amenities for their usage. In 1969, the first DoubleTree Hotel opened. However, Hilton was not affiliated with the brand until its acquisition of the parent company in 1999. Hilton purchased the Flamingo Las Vegas in 1970, which would become the first in the domestic gaming business to be listed on the NYSE. In 1979, founder Conrad Hilton died at the age of 91. Hilton Hotels Corporation later created the Conrad Hotels brand in honor of Hilton. Hilton Honors (formerly Hilton HHonors), the company's guest loyalty program, was initiated in 1987. In 1994, the Honors surpassed competing hotel loyalty programs by offering members both hotel credit points and airline credit miles. The company has been a sponsor of the United States Olympic Team. The company spun off its international operations into a separately traded company on December 1, 1964, known as "Hilton International Co." It was acquired in 1967 by Trans World Corp., the holding company for Trans World Airlines. In 1986, it was sold to UAL Corp., the holding company for United Airlines, which became Allegis Corp. in an attempt to re-incarnate itself as a full-service travel company, encompassing Westin Hotels and Hertz rental cars in addition to Hilton International and United Airlines. In 1987, after a corporate putsch, the renamed UAL Corp. sold Hilton International to Ladbroke Group plc, a British leisure and gambling company, which, in May 1999, adopted the name "Hilton Group plc." As a result, there were two separate, fully independent companies operating hotels under the Hilton name. Those Hilton Hotels outside the U.S. were, until 2006, styled as "Hilton International" hotels. Because the two chains were contractually forbidden to operate hotels in the other's territory under the Hilton name, for many years hotels run by Hilton International in the U.S. were called Vista International Hotels, while hotels operated by the American arm of Hilton outside the U.S. were named Conrad Hotels. In 1997, to minimize longtime consumer confusion, the American and British Hilton companies adopted a joint marketing agreement under which they shared the same logos, promoted each other's brands and maintained joint reservation systems. At that point, the Vista chain was phased out, while Conrad has been restyled as one of the luxury brands of Hilton (along with the Waldorf-Astoria Collection) and operates hotels within the US as well as abroad. In 1971, Hilton acquired International Leisure Company, including the Las Vegas Hilton and Flamingo Hilton. 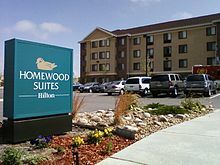 In 1999, Hilton acquired Promus Hotel Corporation, which included the DoubleTree, Red Lion, Embassy Suites, Hampton Inn and Homewood Suites brands. In 2001, Hilton agreed to sell Red Lion to WestCoast Hospitality. On December 29, 2005, Hilton Hotels Corporation agreed to re-acquire the Hilton International chain from its British owner, Hilton Group plc, for £3.3 billion ($5.71 billion). As well as bringing the two Hilton companies back together as a single entity, this deal also included Hilton plc properties operating as Conrad Hotels, Scandic Hotels and LivingWell Health Clubs. On February 23, 2006, the deal closed, making Hilton Hotels the world's fifth largest hotel operator in number of rooms. Hilton Group PLC (headquartered in the UK) then renamed itself Ladbrokes plc. Scandic Hotels was sold the next year on March 1 to EQT Partners. On July 3, 2007, Hilton Hotels Corp. agreed to an all-cash buyout from the Blackstone Group LP in a $26 billion (including debt) deal that would make Blackstone the world's largest hotel owner. At $47.50 per share, the buyout price was 32 percent higher than the closing value of a share of Hilton stock on July 3. The deal was the culmination of a year of on and off discussions with Blackstone. In October 2007, Christopher J. Nassetta was appointed President and Chief Executive Officer of Hilton. 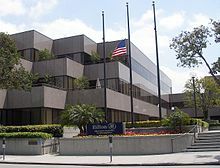 In February 2009, Hilton Hotels Corp. announced that its headquarters were moving from Beverly Hills to Fairfax County, Virginia. While Blackstone saw an opportunity to streamline the company and push Hilton's expansion overseas when Blackstone pursued Hilton in 2006 and 2007, the buyout saddled the company with $20 billion of debt just as the economy was turning down. The debt had very liberal terms, so there was no danger of default, but when travel slowed, the company suffered. In April 2010, Hilton and Blackstone restructured the debt. Blackstone invested a further $800 million of equity and the debt was reduced to $16 billion. Hilton returned to being a public company on December 12, 2013. This second IPO in the company's history raised an estimated $2.35 billion. The Blackstone Group retained a 45.8% stake in the company. The company announced in February 2016 that Hilton would turn its hotel holdings into a real estate investment trust. Prior to making the announcement, the company went to the IRS for approval. As of 2013, about 70% of the rooms branded under Hilton were franchised to independent operators and companies. During its 2007–2013 ownership of Hilton, Blackstone Group pursued a strategy of predominantly expanding Hilton's reach through franchise agreements, while relatively few new properties were actually operated by Hilton. Hence, the proportion of franchised rooms grew significantly during this period. The practice of franchising is popular within the hospitality industry among most major hotel chains, as the parent company does not have to pay for the maintenance and overhead costs of franchised properties. Franchisees must follow strict brand standards in order to maintain a licensing agreement with Hilton. Many of Hilton's flagship properties, airport properties, and largest resorts, however, are corporately managed. Hilton Honors (formerly Hilton HHonors) is Hilton's guest loyalty program through which frequent guests can accumulate points and airline miles by staying within the Hilton portfolio. The program is one of the largest of its type, with approximately 71 million members. There are four levels of elite status within the Hilton Honors program including Member, Silver, Gold and Diamond. Hilton renamed the Hilton HHonors program to Hilton Honors in February 2017. The company has its headquarters in Tysons Corner, Virginia and an operations center in Memphis. Its Asia-Pacific operations are managed out of Singapore, its Middle East and Africa operations are managed out of Dubai, and its European operations are based in the UK. According to Careerbliss.com, Hilton ranked first in the list of "2012 Happiest Companies in America", with a score of 4.36 out of 5. The survey looked at job reviews from more than 100,000 employees, with such characteristics life as work-life balance, company culture and reputation, and the relationships employees have with their bosses. Hilton has scored 100% on the Corporate Equality Index each year from 2014 to 2017. In 2016, Hilton was named one of the "World's 25 Best Multinational Workplaces" by Fortune and Great Place to Work. In 2017, Fortune ranked Hilton number 26 in their list of "The 100 Best Companies to Work For". In 2019, Fortune ranked Hilton number 1 in their list of "The 100 Best Companies to Work For". The 671-room Beverly Hilton in Beverly Hills, California is home to the Golden Globe Awards. It has played host to other awards shows, including the Soap Opera Awards. Keith Richards and Mick Jagger performed in the East Penthouse on the 45th floor of the New York Hilton on October 28, 1965. On the rotating wheel space station in Stanley Kubrick's 1968 film 2001: A Space Odyssey, a receptionist is shown sitting at the entrance to the Hilton Space Station 5. John Lennon and Yoko Ono honeymooned in the presidential suite at the Hilton Amsterdam where they hosted one of their famous "Bed-Ins" for a full week in 1969. In 1971, Diamonds Are Forever was filmed at the Las Vegas Hilton. On April 3, 1973, Dr. Martin Cooper made the world's first cell phone call in front of the New York Hilton Midtown. A press conference was held at the hotel later that day to mark the milestone. In 1976, during a music tour, Ike and Tina Turner were staying at the Statler Hilton (now the Statler Hotel & Residences) in downtown Dallas when Tina decided to leave Ike. Her moments of getting away from Ike and fleeing the hotel were included in her book I, Tina and in the movie What's Love Got to Do with It. The Bodyguard with Whitney Houston and Kevin Costner was filmed at the Fontainebleau Hilton in Miami in 1992. On February 11, 2012, Houston died in her bathtub in Suite 434 of the Beverly Hilton after a drug overdose. Hotel management has since renovated the room. In 1995, the James Bond movie GoldenEye was filmed at the Langham Hilton. The Insider was filmed in 1999 at the Seelbach Hilton. In 2006, several movies including Spider-Man 3, Michael Clayton, and American Gangster were filmed at the New York Hilton. Conrad Hilton (played by actor Chelcie Ross) features as a major character in the third season of Mad Men, as lead character Don Draper creates a series of ad campaigns for Hilton Hotels. 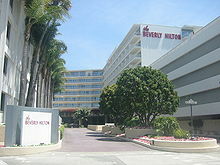 The Drapers travel during one episode to the Cavalieri Hilton in Rome, though the scenes were actually shot at the Dorothy Chandler Pavilion in Los Angeles. ^ a b c d e f g "Hilton Worldwide Holdings Inc. 2017 Annual Report (Form 10-K)". sec.gov. U.S. Securities and Exchange Commission. February 2018. Archived from the original on 2018-04-06. ^ "Hilton At-a-Glance" (PDF). Hiton Worldwide. December 31, 2017. Archived (PDF) from the original on February 27, 2018. ^ a b "Hilton Brands | Global Hospitality Company" (HTML). Hilton. September 30, 2018. Retrieved November 5, 2018. ^ "The Largest Private Companies". Forbes.com. 2010. Archived from the original on 2010-11-07. Retrieved 2010-11-11. ^ Rawlings, Nate. "Hilton Prepares to Go Public With Largest-Ever Hotel IPO". Time. ISSN 0040-781X. Retrieved 2018-12-03. ^ a b "Hilton Worldwide Holdings Inc. Schedule 14A". Securities and Exchange Commission. Archived from the original on 22 April 2016. Retrieved 8 April 2016. ^ Yu, Hui-Yong (October 24, 2016). "Blackstone's Search for Real Estate Buyers Keeps Ending in China". Bloomberg.com. Bloomberg L.P. Archived from the original on October 29, 2016. Retrieved November 10, 2016. ^ "China's HNA Group to buy 25% stake in Hilton". CNBC. October 24, 2016. Archived from the original on October 30, 2016. Retrieved November 10, 2016. ^ "China's HNA Group Just Locked in Another Big Hotel Deal". Fortune. October 25, 2016. Archived from the original on October 27, 2016. Retrieved November 10, 2016. ^ "Hilton Worldwide Holdings Inc. Schedule 14A". Securities and Exchange Commission. Archived from the original on 11 August 2017. Retrieved 10 August 2017. ^ "Hilton Checks Into New Tysons Headquarters". Retrieved 15 August 2015. ^ "Contact Us Archived 2009-09-28 at the Wayback Machine." Hilton Worldwide. Retrieved on October 14, 2009. ^ "Tysons Corner CDP, Virginia". United States Census Bureau. Archived from the original on 2011-11-10. Retrieved 2009-05-07. ^ a b "History and Heritage - Hilton Worldwide". hiltonworldwide.com. Archived from the original on 2016-01-12. ^ Sawyer, Amanda. "Roosevelt Hotel". Waco History. Baylor University. Archived from the original on October 21, 2017. Retrieved August 28, 2017. ^ "A (Brief) History of Hilton Innovations". Fast Company. August 1, 2016. Archived from the original on October 24, 2017. ^ "About Hilton: History & Heritage". Hilton Worldwide. Archived from the original on August 30, 2017. Retrieved August 28, 2017. Note: User must click on "Early 1900s", then slide number 3 for verification. ^ "A History of Firsts". Hilton Hotels and Resorts. Archived from the original on October 23, 2017. Retrieved August 28, 2017. ^ "About Hilton: History & Heritage". Hilton Worldwide. Archived from the original on August 30, 2017. Retrieved August 28, 2017. Note: User must click on "1940s", then slide number 1 for verification. ^ Turkel, Stanley (2009). Great American Hoteliers: Pioneers of the Hotel Industry. AuthorHouse. p. 129. Retrieved August 28, 2017. ^ "21 Years of Hilton Leadership". Chicago Tribune. May 24, 1967. p. 70. Archived from the original on October 24, 2017. Retrieved August 28, 2017. ^ a b "About Hilton: History & Heritage". Hilton Worldwide. Archived from the original on August 30, 2017. Retrieved August 28, 2017. ^ "About Hilton: History & Heritage". Hilton Worldwide. Archived from the original on September 5, 2017. Retrieved September 6, 2017. Note: User must click on "1940s", then go to slide number 3 for verification. ^ Chon, Kaye Sung; Yu, Lawrence (November 12, 2012). The International Hospitality Business: Management and Operations. Routledge. p. 39. Retrieved August 28, 2017. ^ Klein, Christopher (June 16, 2015). "The Birth of the Piña Colada". History.com. Archived from the original on August 11, 2017. Retrieved August 28, 2017. ^ "Waldorf Astoria New York to be sold for nearly $2 billion". Chicago Tribune. October 6, 2014. Archived from the original on October 24, 2017. Retrieved August 28, 2017. ^ Glenza, Jessica (October 6, 2014). "New York's Waldorf Astoria hotel sold to Chinese company for nearly $2bn". The Guardian. Archived from the original on October 24, 2017. Retrieved August 28, 2017. ^ "History and Heritage - Hilton Worldwide". hiltonworldwide.com. Archived from the original on 2016-01-12. ^ "Hilton's Pioneering Central Reservations System -- Hilton Reservations Worldwide -- Marks 50 Years". businesswire.com. 18 April 2005. Archived from the original on 5 March 2016. ^ a b Taraborrelli, J. Randy (April 1, 2014). The Hiltons: The True Story of an American Dynasty. Grand Central Publishing. p. 219. Retrieved September 6, 2017. ^ Hamblin, Dora Jane (August 30, 1963). "His Hotels Keep Conrad Hilton Hopping in 19 Lands: Instant America". Life. 55 (9): 67–68. ISSN 0024-3019. Retrieved September 6, 2017. ^ King, Danny (October 19, 2016). "Airport hotels have become more than a convenient pit stop". Travel Weekly. ISSN 0041-2082. Archived from the original on September 14, 2017. Retrieved September 6, 2017. ^ "Montana Standard-Post from Butte, Montana on July 5, 1965 · Page 4". newspapers.com. Archived from the original on 24 October 2017. Retrieved 28 April 2018. ^ "New Design Is Offered for Hotel Rooms". Lubbock Avalanche-Journal. May 2, 1965. p. 66. Archived from the original on 24 October 2017. Retrieved 28 April 2018 – via newspapers.com. (Registration required (help)). ^ "About Hilton: History & Heritage". Hilton Worldwide. Archived from the original on September 5, 2017. Retrieved September 6, 2017. ^ "About Doubletree by Hilton". Entrepreneur. Archived from the original on October 24, 2017. Retrieved September 6, 2017. ^ "Brand Milestones". Double Tree. Archived from the original on October 24, 2017. Retrieved September 6, 2017. ^ Rothman, Hal (October 15, 2015). Neon Metropolis: How Las Vegas Started the Twenty-First Century. Routledge. p. 22. Retrieved September 6, 2017. ^ Al, Stefan (March 10, 2017). The Strip: Las Vegas and the Architecture of the American Dream. MIT Press. p. 117. Retrieved September 6, 2017. ^ Hilton, Conrad Nicholson (1957). Be My Guest. Simon and Schuster. p. 7. Retrieved September 6, 2017. ^ Cook, Joan (January 5, 1979). "Conrad Hilton, Founder of Hotel Chain, Dies at 91". The New York Times. Archived from the original on November 3, 2017. Retrieved September 6, 2017. ^ O'Connell, Jonathan (February 12, 2013). "Hilton said to be in talks for CityCenterDC hotel". The Washington Post. Archived from the original on October 24, 2017. Retrieved September 6, 2017. ^ Stone, Madeline (January 31, 2017). "Hilton just revealed a game-changing update to its rewards program". Business Insider. Archived from the original on August 21, 2017. Retrieved September 6, 2017. ^ Collis, Roger (December 23, 1994). "Don't Lose Expiring Flier Miles". The New York Times. Archived from the original on November 2, 2017. Retrieved September 6, 2017. ^ Reynolds, Christopher (January 30, 1994). "Frequent Fliers May Find Less Turbulence Overseas : Trends: It's getting harder to qualify for free domestic flights, easier to earn foreign freebies". Los Angeles Times. Archived from the original on April 28, 2018. Retrieved September 6, 2017. ^ Irwin, Richard L.; Sutton, William Anthony; McCarthy, Larry M. (2008). Sport Promotion and Sales Management. Human Kinetics. p. 165. Retrieved September 6, 2017. ^ "Glance: Olympic sponsors on Russia's anti-gay law". San Diego Union-Tribune. Associated Press. February 5, 2013. Archived from the original on October 24, 2017. Retrieved September 6, 2017. ^ Killgren, Lucy (April 22, 1999). "Name Stake". Marketing Week. Archived from the original on May 25, 2013. Retrieved 2012-06-18. ^ "HILTON INTERN. CO., INC. - 888 F.Supp. 520 (1995) - upp52011326 - Leagle.com". leagle.com. Archived from the original on 2 September 2017. Retrieved 28 April 2018. ^ "Nevada Gaming Abstract – MGM MIRAGE Company Profile". Archived from the original on 2012-08-31. Retrieved 2007-03-26. ^ Petersen, Melody (September 8, 1999). "Hilton to Buy Promus Chain". The New York Times. Archived from the original on December 1, 2008. Retrieved 2008-03-23. ^ "Hilton Sells Red Lion, Select Doubletrees To WestCoast". Archived from the original on 2006-11-12. Retrieved 2008-03-23. ^ "About Us". LivingWell Health Clubs. Archived from the original on 2 July 2014. Retrieved 3 December 2014. ^ "The 2006 Ranking of the Top 10 Hotel Groups Worldwide / April 2006". Archived from the original on 24 September 2015. Retrieved 15 August 2015. ^ Louise Story, "Blackstone to Buy Hilton Hotels for $26 Billion," New York Times, July 4, 2007 Archived March 18, 2017, at the Wayback Machine. ^ David Carey & John E. Morris, King of Capital: The Amazing Rise, Fall and Rise Again of Steve Schwarzman and Blackstone Archived 2011-01-08 at the Wayback Machine (Crown 2010), pp. 254. ^ Clausing, Jeri (5 November 2016). "Blackstone goes with Nassetta over Hart as Hilton CEO". Travel Weekly. Northstar Travel Media, LLC. Archived from the original on 16 September 2016. Retrieved 28 June 2016. 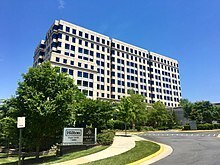 ^ "Hilton Hotels Corporation to move headquarters from Beverly Hills to Fairfax County | Fairfax County Economic Development Authority". www.fairfaxcountyeda.org. Archived from the original on 2017-12-23. Retrieved 2017-12-23. ^ Peter Lattman and Lingling Wei, "Blackstone Reaches Deal to Revamp Hilton's Debt,' Wall Street Journal, Feb. 20, 2010; Hilton Worldwide press release, Apr. 8, 2010; King of Capital, pp. 299–300. ^ Cohan, William (11 September 2014). "Blackstone's $26 Billion Hilton Deal: The Best Leveraged Buyout Ever". Bloomberg L.P. Archived from the original on 13 July 2016. Retrieved 28 June 2016. ^ Rubin, Liz Hoffman And Richard. "Hilton to Spin Off Hotel Properties Into Real-Estate Investment Trust". Wall Street Journal. ISSN 0099-9660. Archived from the original on 2016-01-01. Retrieved 2016-01-02. ^ Ajmera, Ankit (February 26, 2016). "Hilton to spin off real estate, timeshare businesses". Reuters. Archived from the original on May 5, 2016. Retrieved June 15, 2016. ^ Bhattarai, Abha (January 6, 2017). "Hilton completes split into three independent companies". Washington Post. Retrieved June 7, 2018. ^ What to Expect from Hilton’s New Canopy Hotel Brand Archived 2014-12-23 at the Wayback Machine. Condé Nast Traveler. Accessed 2014-12-22. ^ "Do Hilton Points Expire? – Methods to Prevent Hilton Points Expiration". Thrifty Points. 2019-03-07. Retrieved 2019-03-24. ^ Schlappig, Benjamin. "Full Details Of The New Hilton Honors Program". One Mile At A Time. Boarding Area. Archived from the original on 3 February 2017. Retrieved 2 February 2017. ^ "Contact Us Archived 2014-08-26 at the Wayback Machine." Hilton Worldwide. Retrieved on August 17, 2014. ^ "CareerBliss 50 Happiest Companies for 2012". CareerBliss. December 6, 2011. Archived from the original on September 1, 2013. ^ "10 Happiest Places to Work: Is Your Job on the List?". Time. December 12, 2011. Archived from the original on January 7, 2012. ^ "Awards & Recognition- Hilton Global Media Center". news.hiltonworldwide.com. Archived from the original on 17 February 2017. Retrieved 28 April 2018. ^ "The 25 Best Global Companies to Work For". Fortune. October 26, 2016. Archived from the original on November 4, 2016. Retrieved November 10, 2016. ^ "2016 World's Best Multinational Workplaces". Great Place to Work. 2016. Archived from the original on October 31, 2016. Retrieved November 10, 2016. ^ Ting, Deanna (November 1, 2016). "The 3 Hotel Brands on Fortune's List of Best Global Workplaces for 2016". Skift. Archived from the original on November 2, 2016. Retrieved November 10, 2016. ^ "#26: Hilton". Fortune. Archived from the original on May 20, 2017. Retrieved May 5, 2017. ^ "The 100 Best Companies to Work For". Fortune. Archived from the original on May 4, 2017. Retrieved May 5, 2017. ^ "Hilton". Fortune. Retrieved 2019-02-18. ^ "50 Years: New York Hilton Midtown" (PDF). Hilton. Archived (PDF) from the original on December 16, 2017. Retrieved December 15, 2017. ^ 2001: A Spacy Odyssey (Motion picture). Directed by Stanley Kubrick. Screenplay by Arthur C. Clarke and Stanley Kubrick. Cinematography by Geoffrey Unsworth. Edited by Ray Lovejoy. Produced by Stanley Kubrick. Metro-Goldwyn-Mayer. April 3, 1968. Hilton scene occurs at time index 26 mins 54 sec. OCLC 994028060. ^ Novak, Matt (18 November 2014). "What happened to Hilton's 'hotel on the Moon'?". BBC. Archived from the original on 20 December 2017. ^ Adler, Margot (August 25, 2009). "After 40 Years, The Bed-In Reawakens". NPR. Archived from the original on December 16, 2017. Retrieved December 15, 2017. ^ Lawrence, Christopher (November 4, 2015). "When James Bond came to Las Vegas". Las Vegas Review-Journal. ISSN 1097-1645. Archived from the original on September 24, 2017. Retrieved December 15, 2017. ^ Kennedy, Pagan (March 15, 2013). "Who Made That Cellphone?". The New York Times. Archived from the original on November 4, 2017. Retrieved December 15, 2017. ^ Cheng, Roger. "The first call from a cell phone was made 40 years ago today". CNET. CBS Interactive. Archived from the original on December 16, 2017. Retrieved December 15, 2017. ^ Runtagh, Jordan (October 26, 2017). "Tina Turner Recalls the Night She Risked Her Life to Flee Her Abusive Husband—and Musical Partner—Ike". People. Retrieved December 5, 2018. ^ Tyehimba, Cheo (August 2, 1996). "Tina Turner left Ike 20 years ago". Entertainment Weekly. Retrieved December 5, 2018. ^ Diaz, Johnny (October 31, 2017). "'The Bodyguard,' shot at Fontainebleau Miami Beach, turns 25". Sun-Sentinel. Tronc. ISSN 0744-8139. Archived from the original on December 16, 2017. Retrieved December 15, 2017. ^ Duran, Jose D. (February 14, 2012). "The Bodyguard: Whitney Houston's Moment Under the Miami Sun". Miami New Times. Voice Media Group. Archived from the original on December 16, 2017. Retrieved December 15, 2017. ^ Kennedy, Garrick (8 February 2013). "What will happen to the room Whitney Houston died in?". Los Angeles Times. Retrieved 6 November 2015. ^ Smith, Mark (November 9, 2012). "Where to Vacation Like James Bond". Condé Nast Traveler. Condé Nast. ISSN 0893-9683. Archived from the original on December 16, 2017. Retrieved December 15, 2017. ^ Mourby, Adrian (November 2, 2017). Rooms with a View: The Secret Life of Great Hotels. Icon Books. p. 46. Archived from the original on April 28, 2018. Retrieved December 15, 2017. ^ Pfeuffer, Charyn (January 27, 2008). "Bourbon, barbecue and a taste of history in Louisville". New Haven Register. Hearst Communications. Archived from the original on December 16, 2017. Retrieved December 15, 2017. ^ O'Leary, Noreen (November 9, 2009). "'Up in the Air' Grounds Hilton in Star-Power Marketing". Adweek. ISSN 0199-2864. Archived from the original on December 16, 2017. Retrieved December 15, 2017. ^ Landau, David (July 10, 2014). Lighting for Cinematography: A Practical Guide to the Art and Craft of Lighting for the Moving Image. A&C Black. p. 134. Archived from the original on April 28, 2018. Retrieved December 15, 2017. ^ "Hilton New York". New York. ISSN 0028-7369. Archived from the original on December 16, 2017. Retrieved December 15, 2017. ^ Galehouse, Maggie (October 11, 2009). "Mad Men nails its history". Houston Chronicle. Hearst Communications. ISSN 1074-7109. Archived from the original on December 16, 2017. Retrieved December 15, 2017. ^ "Rome on film". Orange County Register. Digital First Media. October 9, 2011. ISSN 0886-4934. OCLC 12199155. Archived from the original on December 16, 2017. Retrieved December 15, 2017. ^ Villarreal, Yvonne (March 26, 2015). "'Mad Men's' final premiere event is a grand affair". Tronc. ISSN 0458-3035. OCLC 3638237. Archived from the original on December 16, 2017. Retrieved December 15, 2017. Wikimedia Commons has media related to Hilton Worldwide.